This we used to call as Vankaya Banda Pachhadi or Vankaya Roti Pachhadi ,As instead of grinding the chutney in Electric Blenders our mothers used to grind the chutney in a grinding stone with hand unlike us using all electricgadgets,in those days.And there is a tremendrous change in the taste of hand made and electric ones. Tamarind paste 2 spoons or a Lime sized Tamarind. 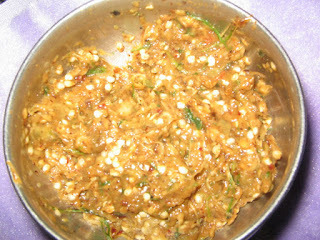 Place a pan on the Stove,add 2 tsp Oil and add Urad daal,Mustard seeds,Methi seeds,Red chillies etc. and after the seasoning splutters add green chillie slits and switch off the stove. In a blender place Tamarind paste and the Seasoning and grind it coarsely,lastly add the mashed Brinjal pulp,Kothmeer and Salt grind it for a few seconds of time.The Chutney should be coarse enough to eat and not a Paste form. Can be used as Side dish, with Rice and even Chhapathis.